I'm a big fan of EA's Need For Speed series - according to Steam, I played Hot Pursuit for over 50 hours on my PC. Their latest addition to the cops 'n' racers stable is Most Wanted, hotly anticipated on consoles because it's from the racing pros at Criterion. But for those without an Xbox or PC and an abundance of mobile horsepower, EA offers the Android version, for a reasonable $7. The mobile version of Most Wanted gets a lot right: a variety of cars, plenty of customization, a great feeling of speed, and some of the best graphics in a racing game yet. 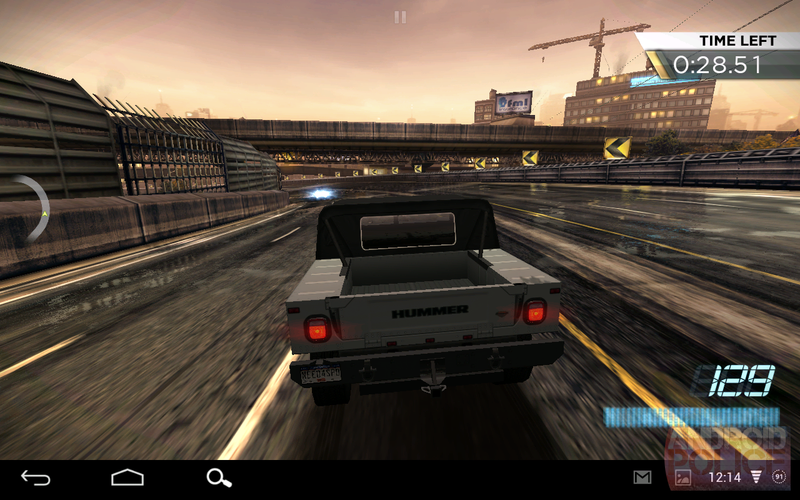 But it also runs afoul of some of the most common pitfalls for touch-based racing games. Overly simplified, easy gameplay, a straightforward progression (as opposed to the open world of the full version) and constant, insistent pushes towards in-app purchases sour what is otherwise a solid racing experience. The appeal of Need For Speed Most Wanted is nearly universal: you're a streetwise street racer giving the middle finger to Johnny Law, who pursues you in almost every event. You'll have to contend with cops, other racers, and the various time limits and bonus objectives to pull in the maximum amount of cash. 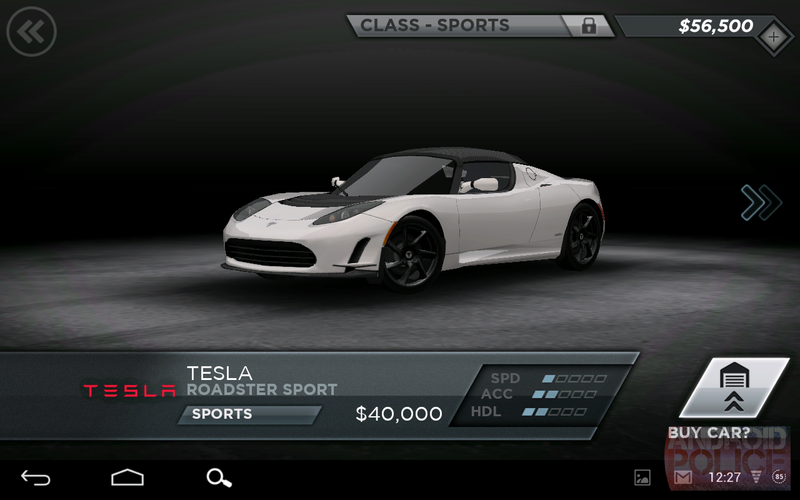 Each race earns you both money and experience, depending upon how well you do: experience unlocks new events and vehicles, but the cars themselves (and nearly everything else) must be bought with your winnings. 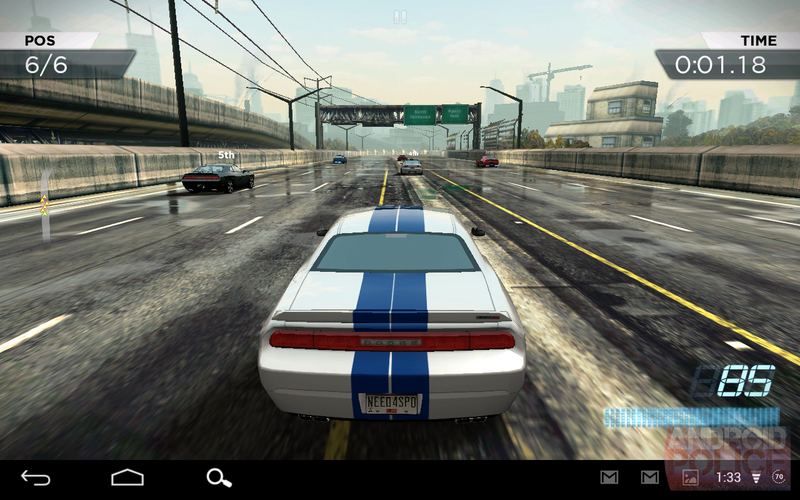 Racing itself is simple, perhaps to deal with the undeniable issue of dodgy touch controls. In the default configuration, turning is handled with the accelerometer, braking with a single tap on the left side of the screen. 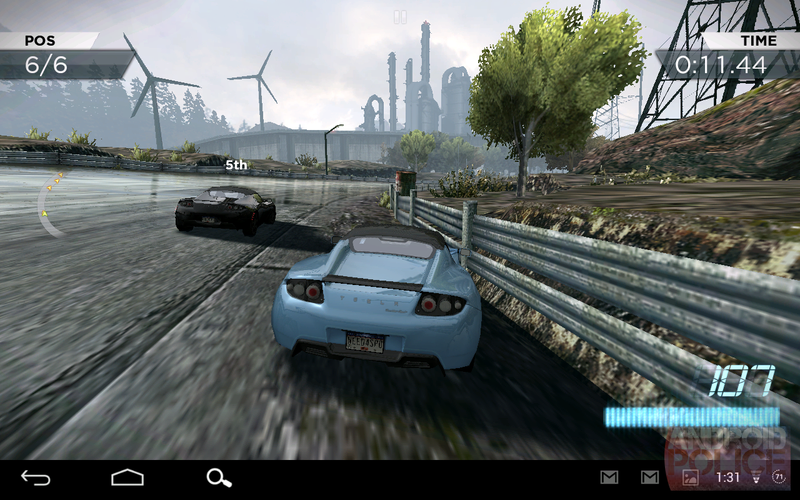 Tap the left side to drift, and swipe up to activate your nitrous. There are none of the tricky gadgets from Hot Pursuit. 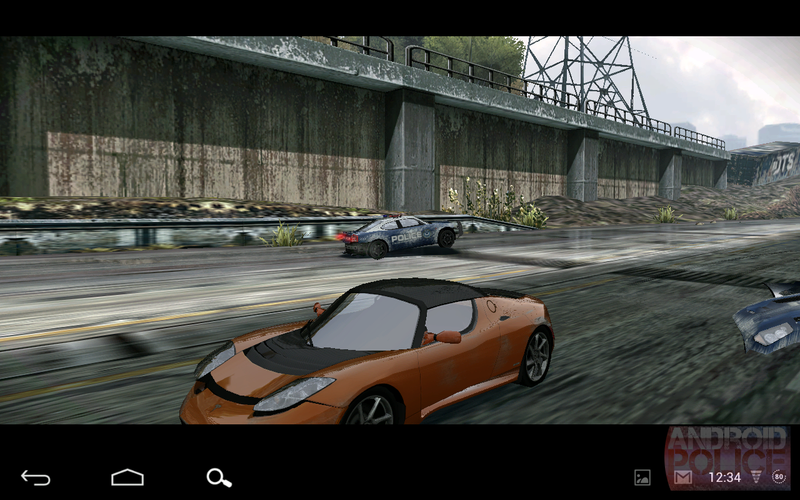 Most Wanted is a more "pure" racing game. There's no option to play as the cops, either. 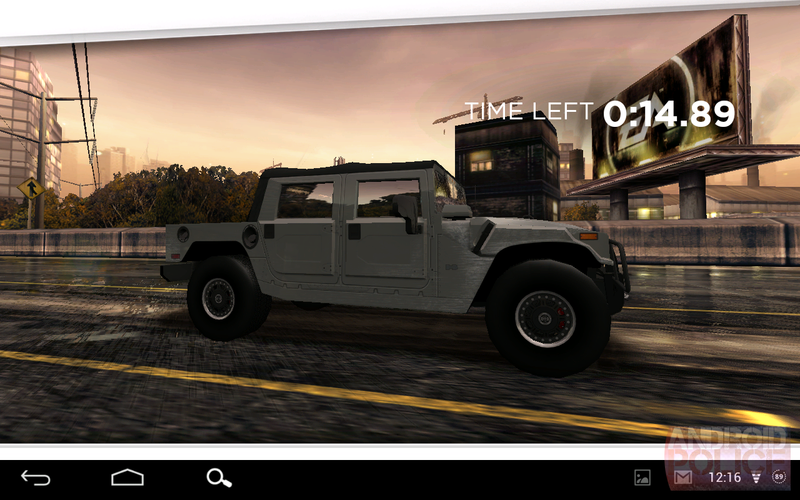 You are the hunted, save for a few one-on-one battles with other racers. Different modes exist, some of them pretty interesting, like one where you need to keep your average speed up across a time trial. Progress through the lower tiers with more mundane cars and you'll open up new areas of the city, with new events to compete in. Do well enough in a given class, and you'll be allowed to challenge one of the "Most Wanted," elite racers driving the best cars in the game. Beat them and you win their rides... which then have to be bought with the money you earn in-game. You can increase your odds by adding modifications to your cars, like run flat tires for speed strips, extra nitrous, or a more toughened chassis. 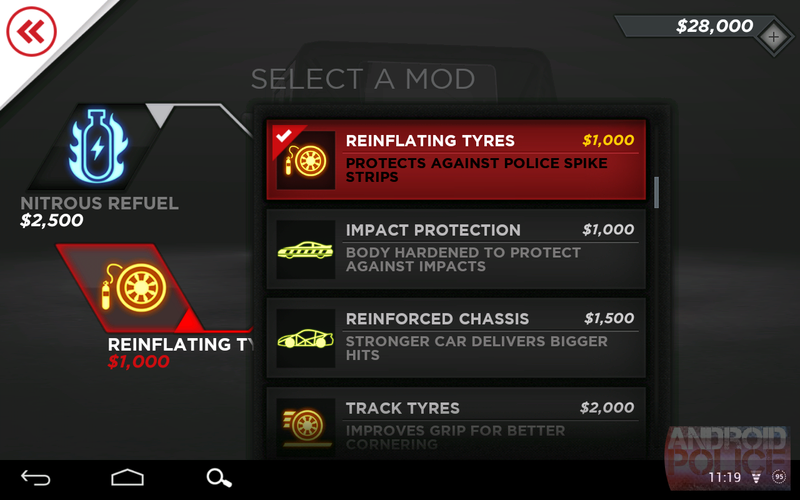 But the upgrades don't' carry over between events: every time you race, you'll have to buy new upgrades, even if you've applied them to that car before. You can probably see where this is going. 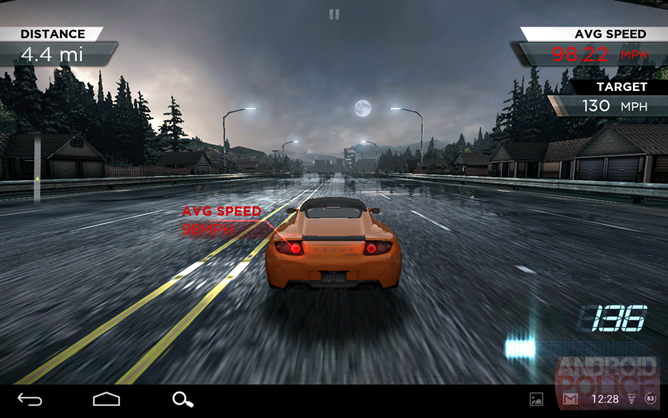 Perhaps to account for the difficulty of mobile controls, or perhaps just to appeal to a wider audience, mobile developer Firemonkeys did everything they could to make the Android version of Most Wanted easy. Tracks are wide, curves are lazy, and traffic is minimal. You'll almost never need to use the drift feature, even in the most powerful exotics, thanks to the incredibly forgiving track design. No narrow tunnels, no hairpin turns - it's a Sunday drive at 180 miles per hour. While the cops are present in almost every event, it's hard to feel threatened by them. Pursuit vehicles only pay attention to the first and second-place racers, and even then, a couple of love taps will take a cop out and refill your boost. Roadblocks and spike strips are more dangerous, but the wide highways make them easy to avoid even with tilt controls. I'd like to make it clear, I'm not saying that Most Wanted isn't fun - a great feeling of speed and a wide variety of cars to play with keep things interesting. But those looking for a tight, challenging game should look elsewhere. If you're looking for eye candy, this is it. 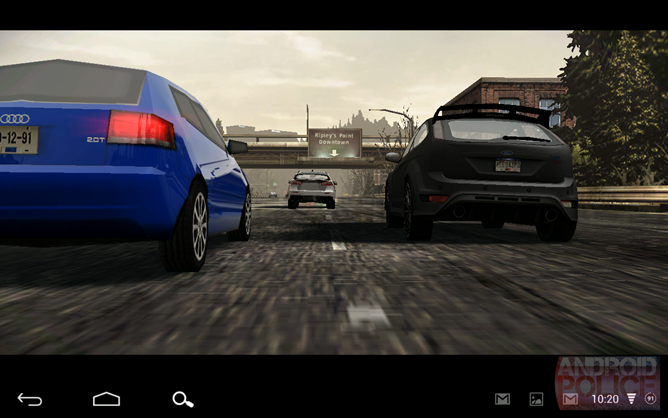 Car models and highways look stunning on the Nexus 7, with reflections and lighting effects everywhere. Real-time car damage and backgrounds are less fleshed out - mostly flat polygons with bland textures - but it's still a very pretty game. 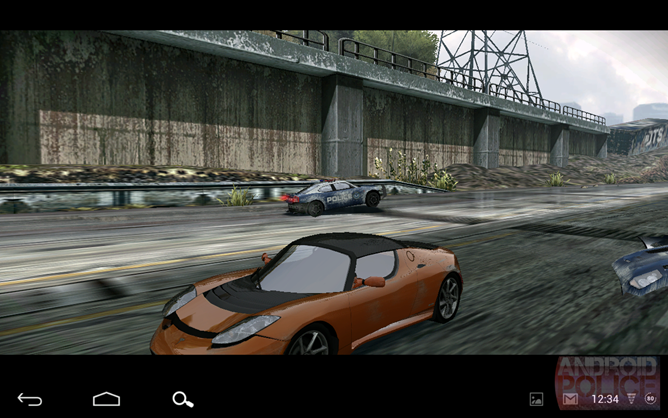 I must point out that the screenshots seen on the Google Play Store look significantly better than what I've seen on Tegra 3 hardware. EA may have simply copied screenshots from the iOS version. Everything in the Android version of Most Wanted costs in-game money. Everything. New cars require both experience-based unlocks and purchases. Upgrades to each car are limited to two slots, and must be bought again after every race... even if you lose. If you're playing a fast, light race category, a few dings from other racers or walls can bust you, instantly tanking $3,000-7,000 worth of cash spent on upgrades. Even a paint job will cost you a couple grand. Naturally, you can spend some real-world dough on in-game currency. This is one of my cardinal sins for mobile games: a paid game plus in-app purchases is greedy, pure and simple, and seeing it in a game that costs $6.99 to start with just makes me angry. Every structural decision in the game, from the unlocking process to individual races, is geared towards getting players to spend some more money on a game they've already paid for. Now to be fair, it's entirely possible to get enough cash in-game without ever resorting to an in-app purchase. You're free to replay events as many times as you like, turning your white-knuckle racing experience into a loot grind. And the purchases themselves (thankfully made through Google Play) are cheap. 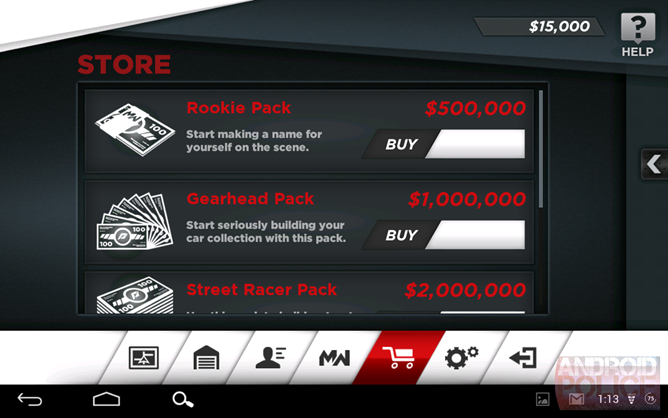 You can get half a million in cash - more than enough to unlock dozens of cars - for just three bucks. I'm sure that plenty of gamers will appreciate the ability to buy all the cool stuff without having to replay levels. Even so, the inclusion smacks of a Glu Mobile-style desire to bleed every player for all they're worth. I have to wonder if console players who paid $60 a pop, with cars that unlock the moment you pass them on the open-world streets, would stand for it. 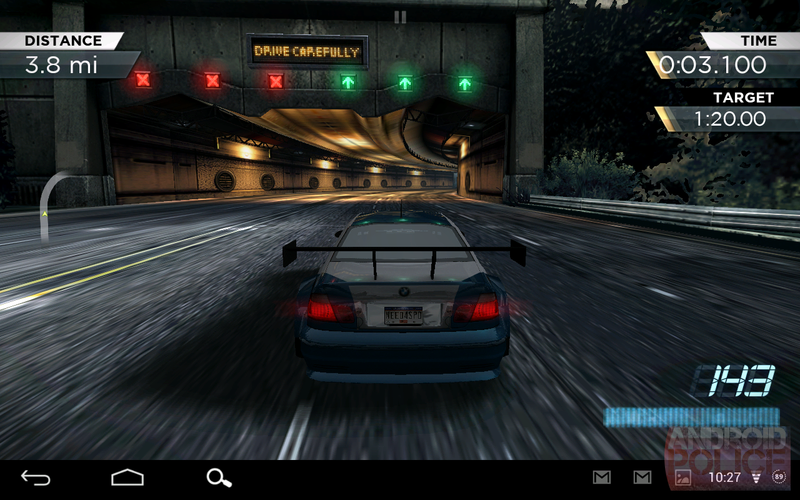 Is Need For Speed Most Wanted fun? Certainly. Anyone with seven bucks, new-ish hardware and a desire to try out some dream machines on their mobile screen will be more than satisfied. 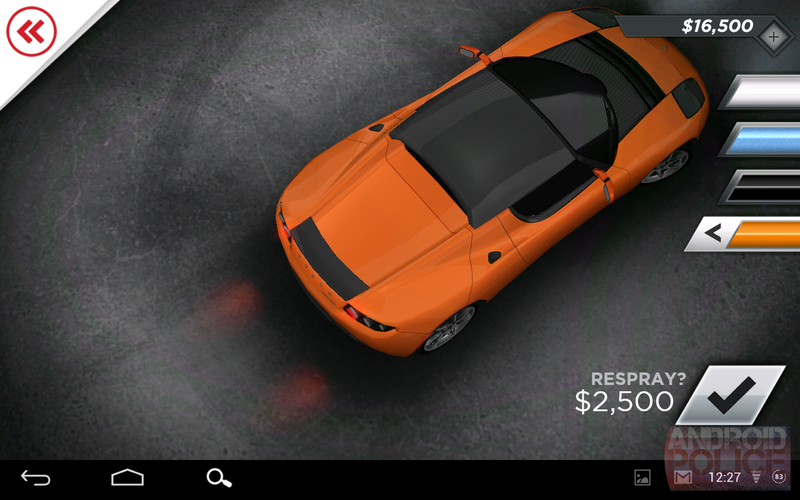 If you're looking for simple, stylish racing, feel free to tap "purchase" without fear of buyer's remorse. That said, the overly simple and easy gameplay - without an option to ramp up the difficulty - won't appeal to those craving a deeper racing experience. And the pushy in-app purchases that the game seems to steer you towards are a real downer, at least for yours truly. I still love the live-action ad, though.